With the popularity of rustic, industrial, and Scandinavian interior design styles, the demand for hardwood flooring also grows. Despite being a trendy material, hardwood flooring presents many visual and functional advantages, especially in the kitchen. Many homeowners would admit that they choose hardwood flooring for the sole reason of aesthetics. Natural wood comes in a variety of colors and grain patterns that look good in a large open space. Its natural appearance breaks the monotony of a room and acts as a beautiful backdrop from a distance. Hardwood flooring comes in different types of wood such as oak, cherry, maple, and walnut. You can sand and stain the wood as you please, or you can also apply a matte wood finish to maintain the natural look of the material. The production of hardwood flooring is environmentally friendly since it involves little to zero toxic products, especially if you source your product from a company that observes ethical processes. Additionally, wood is a biodegradable and renewable resource. Compared to other flooring materials, hardwood offers many underfoot benefits. It feels warmer and more comfortable than tiles and natural stone yet less snug than carpet flooring. It maintains a relatively even temperature throughout the year. When paired with a radiant heating system, hardwood flooring can remain toasty during winter. Hardwood also puts less stress and fatigue on the feet. This is especially true when joints are installed in your floor’s underlay. This insulative material allows you to move around the kitchen all year round without the icy sensation under your feet. Kitchens receive a considerable amount of spills on a daily basis. They may not be as water-prone as bathrooms and basements, but water-related disasters can still happen and pose a risk to moisture-sensitive materials. When you are in the kitchen, you are not only dealing with situations like leaking refrigerators, unchecked sinks, and spilled milk, but you are also working in a high-traffic zone that is always used and passed by multiple people simultaneously. Hardwood provides a durable flooring solution, especially if the type of wood ranks high in the National Wood Flooring Association’s Wood Flooring Hardness Chart. If you want to enhance your floor’s moisture protection, you may apply wood sealant to create an impermeable barrier that prevents moisture absorption. Hardwood flooring can last for decades with proper maintenance. If it does run into some damage, hardwood flooring can be easily repaired or refinished, and it can be as good as new. 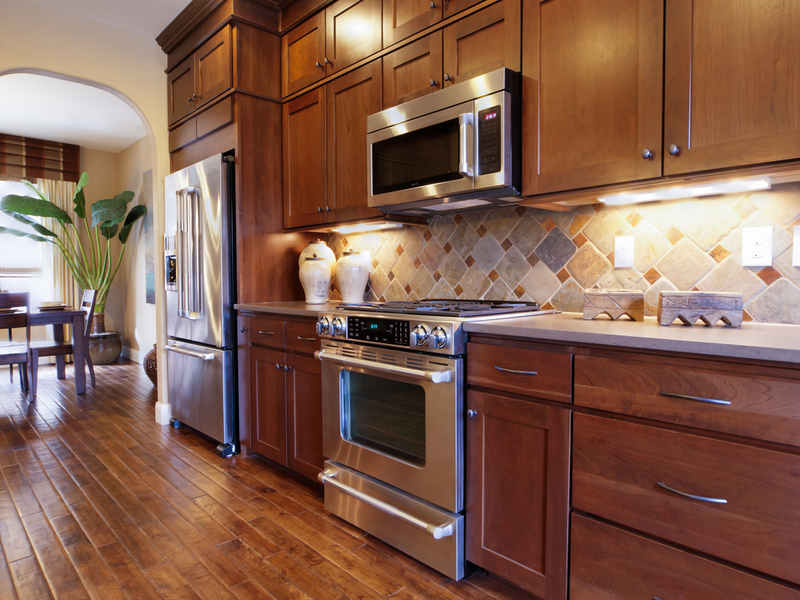 Main Street Kitchen & Flooring offers hardwood flooring and installation services in Orange County. Design your home with only the best and latest brands from our stock. We can help you choose from our wide range of options based on your home requirements and style preferences. As experts in hardwood flooring, we are more than happy to share with you our knowledge to help you make informed decisions. Visit our showroom in Anaheim or call us for more information. Older PostHardwood Flooring: Does It Suit Your Kitchen? #1 Flooring Company in Orange County, since 1997.